Blooming Flower Teas Gift Set comes in a special bamboo case with 5 different pretty flower teas in it. 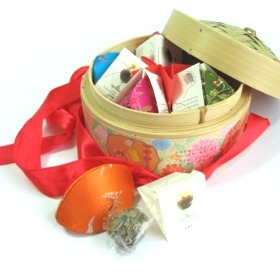 The bamboo case is very useful because it can be used to steam bun or chinese dumplings once you finished the tea. It can also be used as a case to keep your stuffs. Each flower tea is kept in a very unique and beautiful shell case made of chinese silk. The shell cases can be used as jewelry boxes or as decorative items. Each flower tea will surprise you with a different bloom. These teas are specially hand-tied using green tea and natural flowers. This Blooming Flower Teas Gift Set is definately a fabulous gift! Get one Blooming Flower Teas Gift Set for your loved one. Natural aroma of tea and flowers.